Platinum Wedding Ring with Diamond Cut Line and Brushed Finish — Form Bespoke Jewellers Ltd.
A diamond cut line and brushed finish make this platinum wedding ring super stylish. The customer knew that he wanted a contemporary platinum design for his bespoke wedding ring. After visiting our Chapel Allerton studio and trying on a few different shapes and styles, he decided on a court profile which would provide a comfortably fit alongside a classic shape. To ensure a stylish edge, he chose to have a polished diamond cut line running along the centre of the ring to match the polished inside of the band. Then a brushed finish was added across the rest of the band to offer a contrasting matte look. 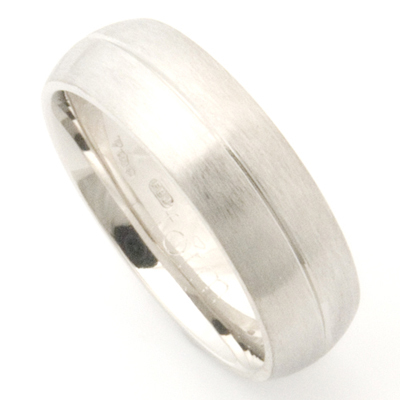 This bespoke gents wedding ring was created as part of a platinum pair for this couple. The bride-to-be had a platinum diamond set fitted wedding ring created by our expert jewellers to sit perfectly alongside her engagement ring.